Machrahanish to Southend. 17 Miles. This was a long and hard day’s walk in pouring rain for a lot of the way. After the twenty miles yesterday, my legs felt a little stiff when I set off but they soon loosened up.The girl in the Tourist Info office said that one of her friends did this walk in about 4 hours. She obviously has no idea, as it was 17 miles of very steep cliff walking with plenty of steep ascents and descents that sapped your strength and made your muscles burn.We left at 1 pm and didn’t reach the hotel and Southend till 9 PM. 8 hours walking with maybe a half hour’s break. We had bought an OS map which turned out to show the wrong location of the path – mapping as it did one of the “proposed” routes and not the actual route. In any case the route was well way marked with the characteristic blue poles of the Kintyre way. Probably just as well as this was a very isolated walk. It reminded me of parts of the Southern Upland Way or the far north of Caithness at Cape Wrath. It certainly wasn’t a Sunday stroll. 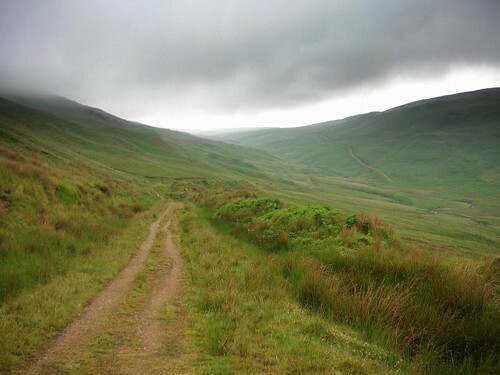 By the time we had walked down the long glen leading to the southern shores of the Mull of Kintyre I was soaked – and getting quite ford, and It was great to peel my wet waterproofs off and have a couple of drinks before catching the 9.30 bus back to Campbeltown. A long, long day which I’m glad to have done nonetheless. You are currently browsing the Scottish Coastal Walk blog archives for the day Tuesday, June 24th, 2008.